Since I began my writing career I have done numerous radio, television, and newspaper interviews so I thought I would share some of the most interesting and frequently asked questions and hope you enjoy them. Due to contractual agreements there are still things that I am not able to discuss. What led you from the clandestine world of espionage to becoming a writer? My long-time Black Ops partner and I had periodically talked about writing a book together; however, he died of cancer before we could do it. Upon retiring and reflecting on all the different experiences I had and the many parts of the world I had been in, I decided to share parts of my life with my family and several close friends. As they learned more about my secretive life they thought it would make for a fascinating story and kept encouraging me to write a book. After about 8 years I decided I would write a book as a fiction but base it on personal experiences and knowledge. I found that I had a knack for mixing facts with fiction and could create what I feel is a very good action thriller novel. 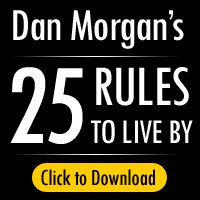 What are some of the disciplines that you and Dan Morgan the hero of your series share? Keep a low profile, be aware of our surroundings, trust our instincts, and remember, NOTHING IS AS IT SEEMS. How did you keep your real job a secret from your family? I had several cover stories / jobs including owning a Classic and Muscle Car Company, an International Promotions Company, a Limousine Company, and a Detective Agency. Many of these jobs allowed me to travel for extended periods of time. You’ve had some incredibly fascinating life experiences, including acting and being a detective as well as your Black Ops involvement. Which of your many careers have you found the most fulfilling and why? I would have to say my career in Black Ops. I always felt that what I did had a meaningful purpose and hopefully would make a difference. It was satisfying to feel the work I did made my country a better and safer place. At the time, my goal was to make the world a more secure place for my daughter. It was the perfect job for me because once given an assignment I was given the flexibility and resources to carry out the mission by any means necessary. I liked the fact that no two assignments were alike, so I was always challenged. My work brought me to many different areas of the world that the average person would never visit. It was also an adrenaline rush to be in life-or-death situations; it took a lot of skill but also luck to survive. Can you share any interesting stories or anecdotes from your time as an operative? Missions weren’t always all field work. During down time, my partner and I attended numerous elegant affairs and met many powerful and influential people. In Monaco, we went to the Formula One Grand Prix and frequented the casinos. We ate at fine restaurants (although in the field we sometimes survived on bugs). Not to mention all the beautiful women we met along the way. Do, you draw upon your life experiences for your books, but did you still conduct other types of research for each book? Definitely. This is true especially for the chapters of the book set in Afghanistan where local customs, terminology for clothing, dialects, specific buildings, food, etc. were all researched from books and, especially, news articles, to best give the reader a sense of being there. I have found that each book requires very specific research. Was there anything particularly interesting that you discovered during your research that didn’t make it into the novels or something that you’d like to highlight? The scope of the stories doesn’t really allow for a deep exploration of the issues of Middle East or other trouble spots in the world, nor of the many problems with the military’s reliance on security contractors—even though the book touches on these issues, it ultimately isn’t a political book. On a lighter note, I discovered that the Kabul Zoo apparently houses the only pig in all of Afghanistan, and it was quarantined back during the swine flu scare in 2009.